Dragon Spin slot is a 5-reel, 30 payline progressive jackpot video bonus game offered by SG Interactive. Scientific Gaming’s gaming platform is a distribution hub for top leading gaming providers in the online and land-based gambling industry such as Bally Technologies. This particular slot is a Bally title, and can be found on land-based casino floors as well as online at several different gambling, free play and social media sites. Dragon Spin is one of the newer video slots to join the SG Interactive family. It boasts an Asian theme telling a story of the medieval Dragon and his challenges to guard his treasure. 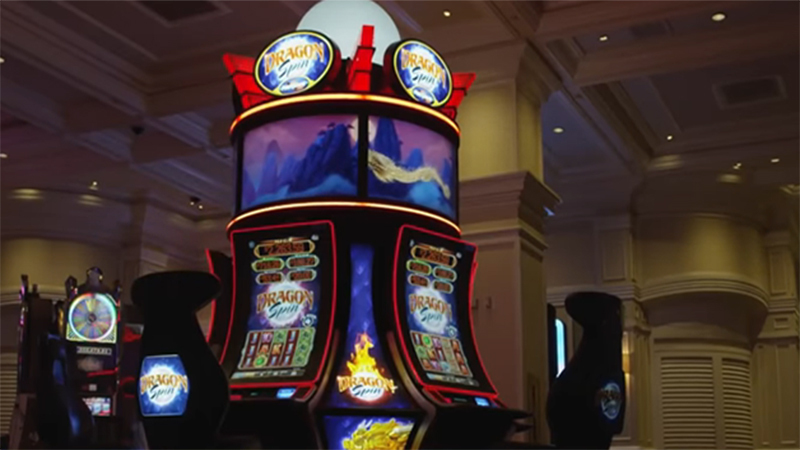 Dragon Spin slot is considered a penny slot and can be found within a community bank section of the casino. There are several versions of the game out there, but rest assured nothing compares to the actual game. Betting on Dragon Spin slot is unique in its own way! You wager against the paylines, and have the option to make a bonus bet to get you to the jackpot feature. Max bet is 400 coins with a 20-credit bonus wager. Minimum bet is .30 with several options in between, whatever your budget, Dragon Spin Slot accommodates low rollers and higher stake players. Of course, betting the maximum bet will get you the biggest rewards and top progressive jackpot, since there are five different levels. Minimum bet can also trigger the jackpot, just one of several reasons why Dragon Spin is different from other slot games and has become very popular within the slot community. Three Green Gold Gem bonus symbols trigger five spins with 1 of 3 possible free spins bonus features. The three free games bonus options are Raining Wilds for the first choice. Raining wilds rain down on the screen turning random symbols into wilds. Persisting Wilds Free Games is the second option. During this feature new wilds are added with every free spin, and is locked into place for the duration of the free spin feature. The third option is the Reel Blast Free Games feature. This feature plays out a little differently from the other two with three sets of reels activated. The center reels will be covered entirely with one single symbol. Mystery Stacked Reels will be awarded at random. All non-bonus symbols will appear stacked across the reels. The Wild symbol is available with the Mystery Stacked Reels only. Stacked wilds are what makes any slot appealing. Dragon Spin slot’s wild is represented by the Golden Wild symbol. It can appear on any of the reels and has the potential of filling up each reel with stacked payouts. The only symbol it will not substitute is the scatter or bonus symbols. Five progressive jackpots! The best part of this game are the jackpots and the community feature. The community feature is an awesome benefit of playing the Dragon Spin slot. This feature triggers when one of the progressive jackpots are won. Whenever a progressive jackpot is won, anyone who is playing a Dragon Spin slot, in the same group of machines, will be rewarded part of the jackpot, so everyone wins! The jackpot feature is triggered at random, as long as the bonus bet is enabled. When the moon randomly appears on any of the symbols across the reels you are taken to the jackpot feature. Here you must pick from 15 moons that appear. The goal here is to pick three of the same jackpot; Mini, Minor, Major, Maxi or Mega. When three of the same corresponding jackpot symbols are matched up you win that progressive jackpot. Players looking to play Dragon Spin slot today online can find a demo version of the game. No real money wagers can be made, all in fun and practice play! Players from across the globe are able to enjoy real money wagers online when playing, but unfortunately not players who reside in the USA. The demo version is the perfect way to get a feel of how the game plays and pays out. The same great audio, high quality graphics and immersive playing experience will be had whether playing online for fun, or if you were sitting in one of SG Interactive’s gaming chairs.